#1 What evidence can support the arguments that cutting off secondhand clothing imports from Africa will allow African nations to build their own textile industry? 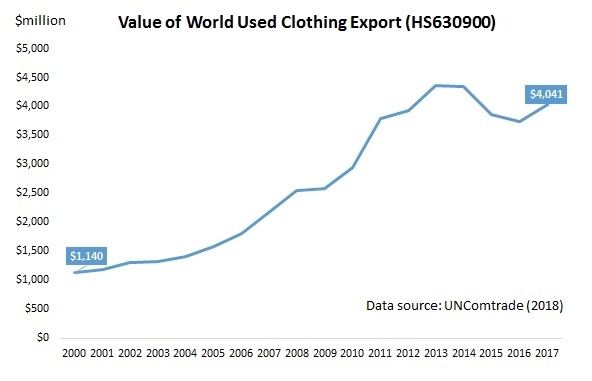 Likewise, what evidence can support the arguments that African countries overall benefit from importing used clothing from countries like the United States? #2 Given the debate on used clothing trade on African nations, will you continue to donate used clothing? Why or why not? #3 China holds a dominant position in textile and apparel production and exports because of their vast amounts of technology, workers, and resources. How do you think least developing countries like Africa will be able to keep up with such steep competition? Why or why not it is a wise decision for the United States to threaten to take away East African countries’ benefits under AGOA? #4 Is factory employment in India a step in the right direction for the country’s gender equality? What effects, positive or negative, could such employment have in regards to gender issues? #5 We keep arguing that globalization is negative because we are taking jobs away from U.S. workers. But by sending more work to factories in India, we’ve created jobs for these Indian women who, before working in the factories, were sheltered and only sent off into the world for arranged marriage. In this sense, is globalization still negative if we’re creating a sense of freedom and purpose for these women? #6 As detailed in the article, the working conditions and treatment of workers is extremely unethical in some garment factories. Can globalization help this issue or hurt it more? #7 How do you compare your life to the Indian girls in the article? And please just imagine: ten years later, what will the life of these Indian girls look like? How about yours? Welcome to our online discussion! Please mention the question # in your comment. According to latest statistics from the World Trade Organization (WTO), in 2016, the average applied tariff rate remained at 10.5% for textiles and 17.5% for apparel worldwide. Compared with the average tariff rate for all sectors, the tariff rate for textile and apparel is 1.4 percentage points and 8.4 percentage points higher respectively. The result suggests that while tariff may no longer be a critical trade barrier for some sectors, it still significantly matters for the textile and apparel industry. Least developed countries (LDC) overall set a higher tariff rate for textiles and apparel than other more advanced economies. For many poorest countries in the world, tariff remains the single largest source of tax revenue for the local government. However, it is also true that should these LDCs lower their tariff rate for textile inputs such as yarns and fabrics, it may help apparel manufacturers in these countries lower production cost and improve the price competitiveness of their finished apparel products in the world marketplace. 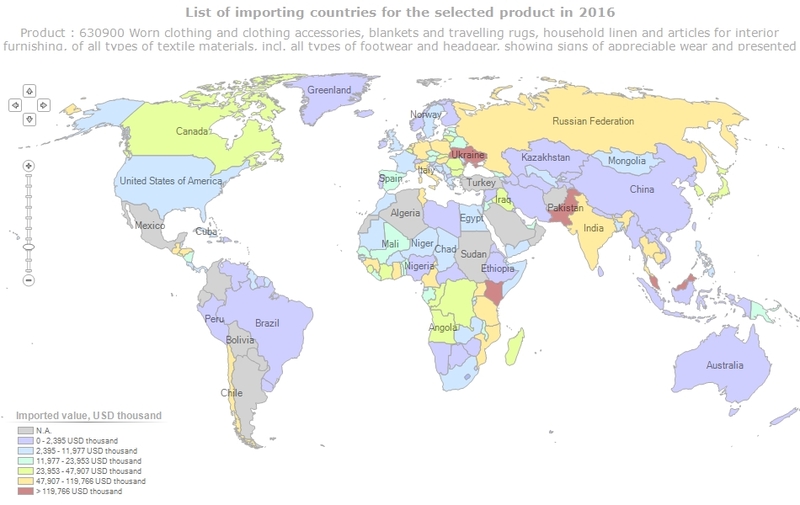 At the country level, countries with the highest tariff rate for textiles include Bahamas (37.1%), Ethiopia (28.0%), Uzbekistan (24.5%), Algeria (24.0%), Argentina (23.3%), and Brazil (23.3%). 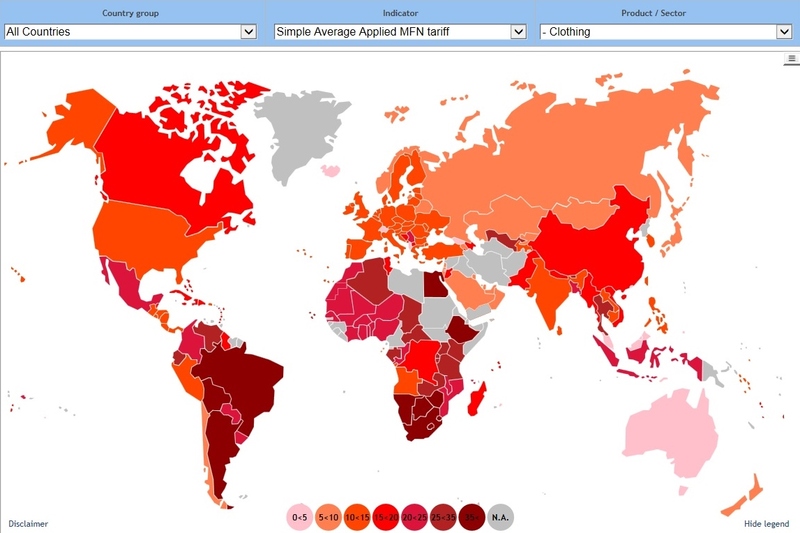 Whereas countries with the highest tariff rate for apparel include South Africa (41.0%), Namibia (41.0%), Swaziland (41.0%), Botswana (41.0%), Lesotho (41.0%), Bolivia (40.0%), Egypt (38.4%), Argentina (35.0%), Ethiopia (35.0%) and Brazil (35.0%). Data also shows that the import tariff rates of the US, EU(28) and Japan, the top three largest textile and apparel importers in the world, stay unchanged over the past three years. 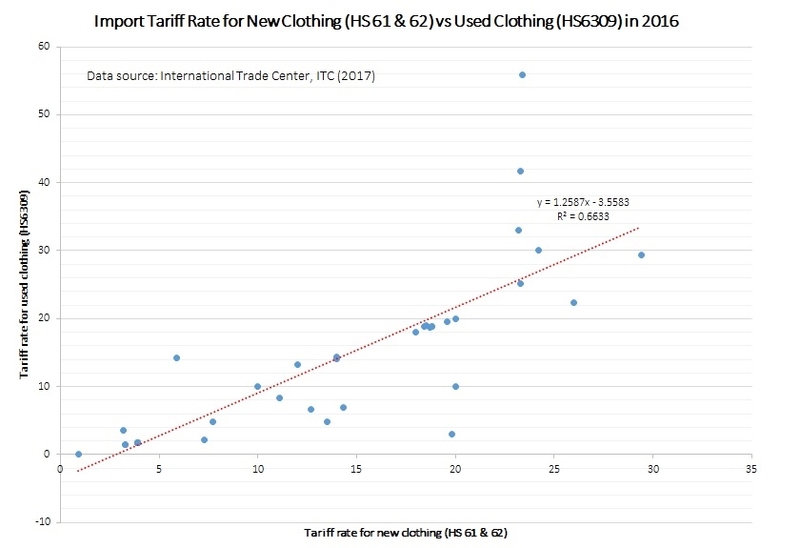 Additionally, there seems to be a positive relationship between a country’s import tariff rate for new clothing (HS 61 & 62) and used clothing (HS 6309). 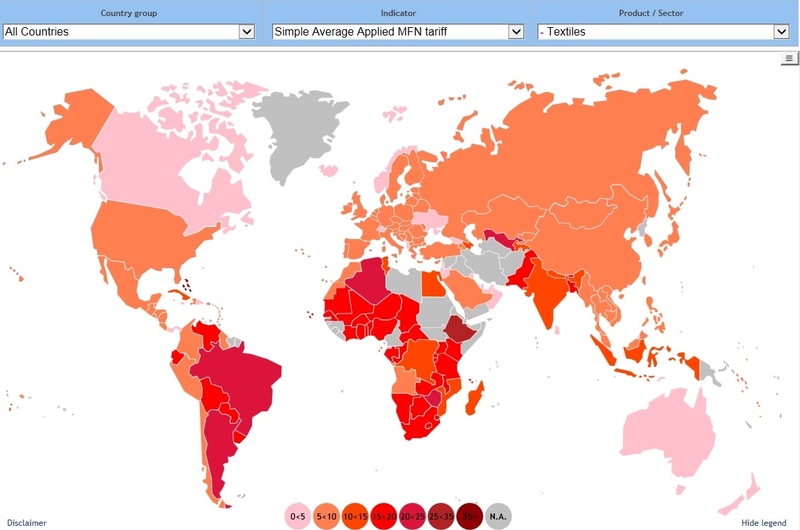 Of the total 180 countries covered by the International Trade Center (ITC) database, about 62.7% set an equal or higher tariff rate for new clothing than used clothing. Some African nations place a particularly high tariff rate for used clothing, including Zimbabwe (167%), South Africa (149%), Rwanda (117%), Namibia (80%), Tanzania (56%), and Uganda (41%).